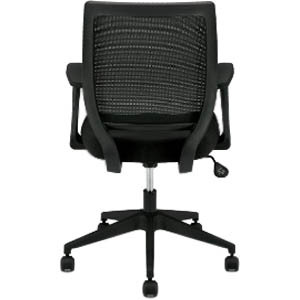 Mid-back work chair offers a supportive mesh back and mesh seat for responsive seating. Fixed position T-arms provide straight-forward support for forearms in nondemanding applications. Distance between arms is 18-1/2", and the height from the seat is 9-1/8". 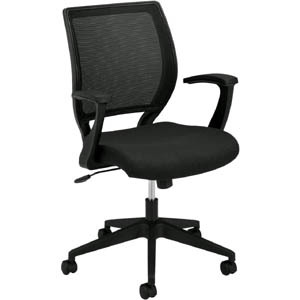 Functions include 360-degree swivel, pneumatic seat-height adjustment from 17-1/2" to 22", tilt, tilt tension, and tilt lock. 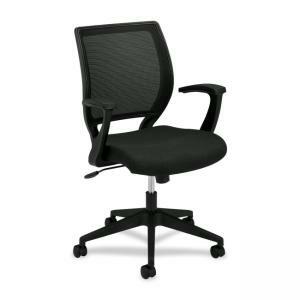 Tilt allows a comfortable rocking/reclining motion. Tilt tension adjusts the amount of resistance when reclining to accommodate individual weight and work styles. 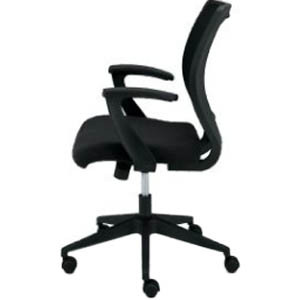 Tilt lock secures the chair in an upright position for constant back support when not reclining. Five-star base features 2" diameter dual black wheels and injection-molded plastic. Arms are also made with black injection-molded plastic and built-in polyurethane arms pad for comfort.